1. Put the blueberries in a small saucepan with the lemon juice and cook very gently for about 5 minutes until softened. Break up the berries with a wooden spoon, add the sugar and let the mixture bubble gently for 1–2 minutes, until thickened. Leave to cool. 2. Preheat the oven to 200°C, gas mark 6. Grease a large baking sheet. To make the dough, put the flour and baking powder in a bowl and add the butter. Rub in with your fingertips until the mixture resembles breadcrumbs. Peel the apple and grate the flesh directly into the dough, working around the core. Stir in the sugar and milk and mix to a dough. 3. Turn out onto a well-floured surface and roll out to a 45 x 18cm rectangle, dusting with additional flour as needed. Trim the long edges to neaten. Spread the blueberry mixture thinly over the dough and cut lengthways into 10 strips. 4. Half roll up one strip (see picture, above left). Bring the middle of the unrolled strip to meet the coiled dough and pinch in place to make one floppy ear. Do the same with the remaining strip of dough to make the second ear and press it into place. Transfer to the baking sheet and make the remainder in the same way. 5. Push a small blueberry into the centre of each spiral for a nose, and press 2 flaked almonds below for teeth. Bake for 10 minutes until risen and just beginning to colour. Leave to cool slightly. 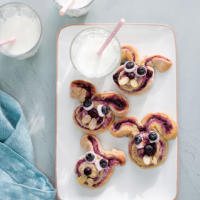 Halve 10 blueberries, then use writing icing to make eyes on each bunny and stick a halved blueberry in the centre of each one. This recipe was first published in Mon Mar 02 15:20:00 GMT 2015.